Andrews Bald is a premier destination for hikers seeking that perfect view of the Smokies. The Andrews Bald trail is the balanced combination of distance and difficulty that allows hikers, even families, to truly enjoy this hike. Andrew’s Bald is also the highest bald in the Smokies. 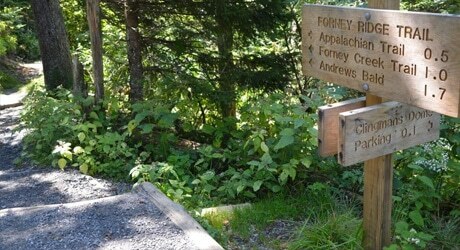 Andrews Bald Trail Upgrades: In 2008, thanks to the Trails Forever program, hiking Andrew’s Bald became easier. During the multi-year project, workersbegan rebuilding the Andrews Bald trail by placing flat stones across differentportions of the path, along with constructing trail steps out of locust woodand native rock throughout. Drainage structures and existing boardwalks wereelevated to help maintain the longevity of the trail and increase hiking safetymeasures. 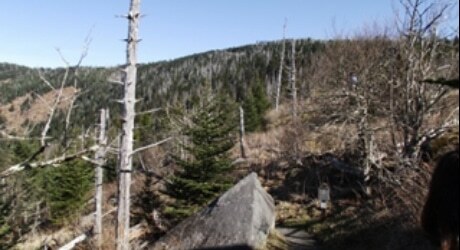 Hiking Forney Ridge Trail to Andrews Bald: The hike begins down the southern edge of Clingmans Dome, known as Forney Ridge. This part of the trail takes hikers into a spruce-fir forest. Through this part of the hike you may notice that there are many dead spruce trees. This is caused by an insect, the balsam woolly adelgid, which infects Fraser Firs. Once you’ve hiked at least a tenth of a mile in from the trailhead, the Clingmans Dome Bypass Trail will start to fork off to the right. However, if you go left at this interchange, the path will continue up to Andrews Bald trail. Near the 1.7 mile mark, the outskirts of Andrews Bald, you will come to a grassy meadow, known as a bald, which makes for a fantastic picnic spot. The sights aren’t bad either with panoramic views of the highlands, Fontana Lake and the southern Smokies. Starting at the Sugarlands Visitor Center and drive 13.2 miles south on Newfound Gap road. Turn Right onto Clingmans Dome Road and drive another 7 miles to the end of the road. The trail can be accessed via the Forney Ridge Trail which is located at the far end of the parking lot.